We headed down the coast along Hwy 1. It was pretty foggy, kind of damp and dreary after leaving the summer sun in the valley. An earthy, salty smell caught my daughter's attention. The inevitable, "are we there yet?” broke the pristine view. Twenty miles north of Santa Cruz, and a world away, lies the "Coastal Lodge & Camp" of Costanoa. Inspired by the tent cabins of the '30's and '40's, this new age persona of roughing it is actually quite pleasant. We headed up the Eucalyptus lined drive to The Ranch House for check in and tent assignments. Packing sleeping bags and pillows (and none of the other camping paraphernalia), we opted for the basic Eco Tents. What a surprise! Perched amid the long grasses and other native vegetation, we looked right out at the Pacific just as the fog was lifting. Wow. At first the quiet and solitude was a little unsettling. Especially with rowdy kids. We explored our tent - unzipped all the canvas windows, climbed up and down on the bunks, swept out some sand - and pondered what to do next. We explored the "comfort stations", complete with individual showers, trendy architecture and an outdoor fireplace. This camping thing was certainly looking better. We walked over to the General Store for a look-see. Yum. Throw out the cook stove, this was gourmet take out - including a children's menu with macaroni and cheese! Yeah, I was going to like this camping trip. The kids discovered the playground and were pleasantly surprised to encounter quite a few other children to hang out with. They set a date to hook up for the nightly movie in the Ranch House (Disney rules). We set off on foot toward the Pacific. Crossing Highway 1, we found some great trails that meandered toward the beach. Other than the bothersome Poison Oak, we encountered a plethora of native plants, birds and sea life. My daughter was mesmerized by the huge starfish. My son couldn’t get enough of the sandy banks for rolling and jumping. And best of all, the beach was deserted and ever so peaceful. That’s what Costanoa is about. Peace and quiet. It’s a chance to combine some quality family time with some nature without the trials and work of the usual camping trip. The kids loved their first night in the Eco Tent. Giggles and flashlights and the inevitable midnight trip to the comfort station. But that trip got us a memorable moonrise, complete with the muffled neighs of the resident horses huddled under the Eucalyptus trees. The morning brought lots of fog and restless kids. We headed out by car to explore the coastline. State beaches line the coast and we explored a few before heading up to the famed surf spot, Mavericks, just past Half Moon Bay. Unfortunately the surf was flat, but Pillar Point Harbor was quaint and picturesque. Restless again, we were on the move to explore as much as possible of the region as the sun came through the fog. It would take a week to hit every major area attraction so we chose a few family activities and in our newfound peaceful mode we moseyed down the road. Elephant Seals & Interpretive Center at Año Nuevo - a bit of a hike, but well worth it to see the elephant seals. Also an interpretive center with a bookstore and displays. 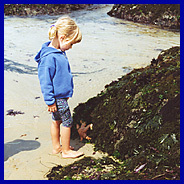 Pigeon Point Tidepools – you can spend hours treading the tidepools looking at little sea creatures. Go during low tide, wear sneakers or water shoes (they will surely get wet). Be sure to leave all of the sea creatures in their own habitat. Birdwatching at Pescadero Marsh Nature Preserve – There are guided tours on Saturdays (10:30am) and Sundays (1 pm). The kids may get a little bored, but if you let them play in the mud, they’ll love it! Berrypicking at Coastways Ranch – you can pick your own olallieberries (June/July), pumpkins (October), kiwi fruit (November/December), or Christmas trees (December). This memory will last a lifetime. Call (650) 879-0414 for more info. Phipps Country Ranch – is great fun for the family. Kids can feed the cow, donkey, goats or potbelly pig. The farm store is eclectic and worth browsing for homemade jam, fresh picked fruit, and veggies. Call (650) 879-0371 for info or see their website www.phippscountry.com . If that’s not enough to keep you busy, Costanoa organizes their own activities right on site. Most events take place on the weekend, but busier holiday weeks can also hold some treasures. Enjoy local jazz, rock and soloists every Saturday night throughout the summer. Or hunker down to hear some Native American Storytelling by the local Ohlone tribes. Hear the adventures of “old man Coyote” around the fire. Or take in some yoga or a naturalist hike. Or hook up with one of the resident cowboys for an excursion on horseback. The Tennessee Walking Horses look a bit out of place on the coast, but these gentle horses will take you on a gorgeous trail ride with views of the coastline and the mighty Pacific. 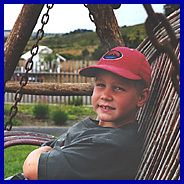 And last, but certainly not least, think of enrolling the kids in the Costanoa Kids Camp. For campers ages 5-12, this weekend camp introduces kids to a range of activities – plus gives you some grown-up time for a special hike, picnic or even a massage. Costanoa has a variety of accommodations to choose from. Premium lodge rooms, cabins, deluxe tents, Eco tents or even a spot to pitch your own tent, but we recommend the tent experience. Eco tents have bunk beds; Adventure tents have a double with one twin and are a step up, some include linens. Prices range from $30 (own tent) to $240 for a fancy lodge room. The Eco Tent is $70. Check for frequent specials. Costanoa is also a great place for a family reunion. For reservations see their website at www.costanoa.com or call (800)738-7477. Their direct line is (650)879-1100. Details: Costanoa, P.O. Box 842, 2001 Rossi Road at Hwy 1, Pescadero, CA 94060. Located along the pristine coast of California's scenic Highway 1. Centrally located near San Francisco (55 miles), Santa Cruz (25 miles), San Jose (45 miles), and Half Moon Bay (25 miles).